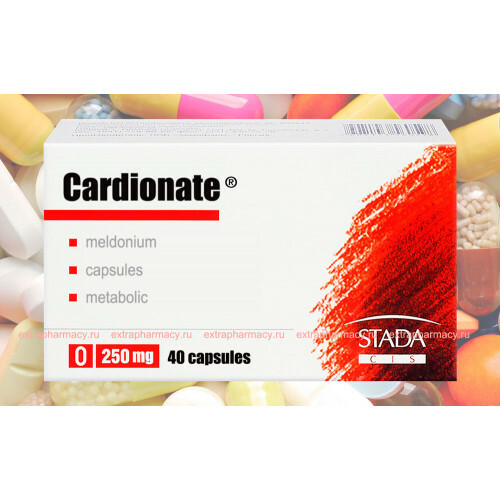 Cardionate is an authentic russian product manufactured under strict control of russian authorities. Meldonium restores the balance between cellular oxygen demand and delivery of oxygen, eliminates the accumulation of toxic products of metabolism in the cells, protecting them from damage; also has great tonic effect. As a result of its use - the body acquires the ability to withstand stress and to quickly restore energy reserves. 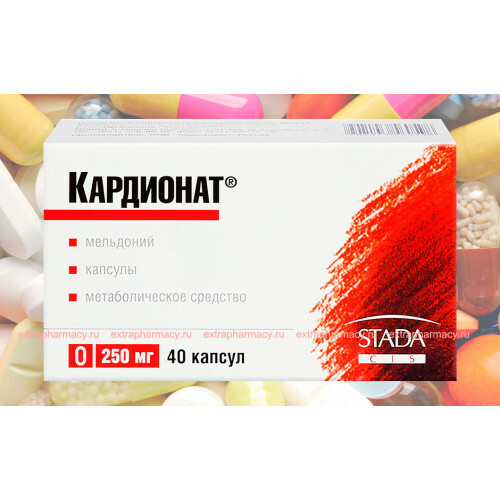 Because of these properties Meldonium is used to treat a varietyof disorders of the cardiovascular system, the blood supply to the brain, as well as to improve physical and mental performance. As a result of reducing the concentration of carnitine hard gamma-butyrobetaine is synthesized, and it has vasodilating properties. In the case of acute ischemic myocardial injury Meldonium slows the formation of necrotic areas, and allows to shorten the rehabilitation period. In heart failure Cardionate increases myocardial contractility, increases exercise tolerance, reduces the frequency of angina attacks. In acute and chronic ischemic cerebrovascular disorders Cardionate improves blood circulation in the ischemic focus, promotes redistributionof blood to the ischemic area. Cardionate is effective in the case of vascular and dystrophic pathology of the ocular fundus. It eliminates functional disturbances of the central nervous system in patients with chronic alcoholism during abstinence syndrome. reduced working capacity, physical stress, includingin athletes. That pamphlet contains full information about Pharmacologic action, Pharmacokinetics, Indications and Contraindications, Side effects, Interactions, Dosing and Administration and Storage conditions of Meldonium.